MEPCO stands for Multan Electric Power Company. It is an electric distribution company which supplies electricity to different districts that comes in Multan region. MEPCO has the official licensee by the NEPRA (National Electric Power Regulatory Authority) for distribution of electricity. It seems too much difficult to stand in a queue and wait for your turn for paying bill. To avoid this problem MEPCO design its Web Billing system for checking your MEPCO Online Bill from the site. You can view, print and download your bill via this link. Your MEPCO consumer bill contains details of your monthly electricity consumption and the resulting total cost. First of all go to the web browser that you frequently used as Google, Firefox etc. Open the official website of MEPCO or paste this site. After this go to link for checking your bill site. After clicking this link the following page would be load. This page is the online web portal for the consumers to check their online bills. 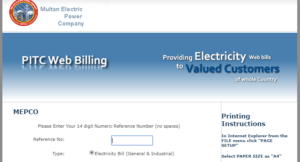 Enter your 14 digit numeric reference number without spaces for checking your electric bill. After entering the 14 digit reference number click on Submit Button for further procedure. Both the General & Industrial Electricity Bills of recent month can be checked from this procedure via MEPCO official website. MEPCO is one of the biggest electricity distributor of Punjab covering 13 districts of South Punjab. The services of MEPCO are for these above districts. If you fall in one of these districts then you can avail the service of Online Electricity Bill Checking by the above described method.